Citation Information: J Clin Invest. 2007;117(4):944-952. https://doi.org/10.1172/JCI29967. Platelets are critical for normal hemostasis. Their deregulation can lead to bleeding or to arterial thrombosis, a primary cause of heart attack and ischemic stroke. Src homology 2 domain–containing inositol 5-phosphatase 1 (SHIP1) is a 5-phosphatase capable of dephosphorylating the phosphatidylinositol 3,4,5-trisphosphate second messenger into phosphatidylinositol 3,4-bisphosphate. SHIP1 plays a critical role in regulating the level of these 2 lipids in platelets. 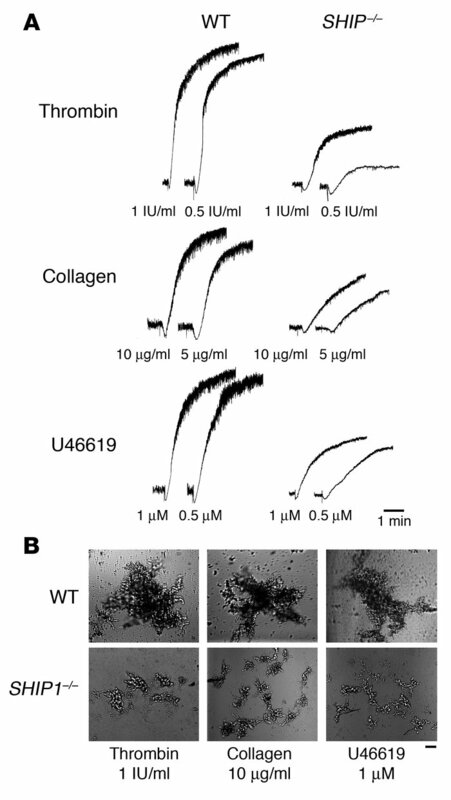 Using SHIP1-deficient mice, we found that its loss affects platelet aggregation in response to several agonists with minor effects on fibrinogen binding and β3 integrin tyrosine phosphorylation. Accordingly, SHIP1-null mice showed defects in arterial thrombus formation in response to a localized laser-induced injury. Moreover, these mice had a prolonged tail bleeding time. Upon stimulation, SHIP1-deficient platelets showed large membrane extensions, abnormalities in the open canalicular system, and a dramatic decrease in close cell-cell contacts. Interestingly, SHIP1 appeared to be required for platelet contractility, thrombus organization, and fibrin clot retraction. These data indicate that SHIP1 is an important element of the platelet signaling machinery to support normal hemostasis. To our knowledge, this is the first report unraveling an important function of SHIP1 in the activation of hematopoietic cells, in contrast to its well-documented role in the negative regulation of lymphocytes. Aggregation defects in SHIP1-deficient platelets. (A) Platelets were stimulated with thrombin, collagen, and the thromboxane A2 analogue U46619, and aggregation was assessed with a Chrono-log dual-channel aggregometer under stirring at 900 rpm for 5 minutes. The profiles shown are representative of 5 independent experiments. (B) Platelets were then fixed with 1.5% paraformaldehyde for 30 minutes at room temperature, and observed by differential interference contrast with the use of a Nikon Eclipse TE 2000-U equipped with a ×10 objective and a DXM 1200 digital camera (scale bar: 40 μm). Data shown are representative of 3 independent experiments.